The heart of Virginia is its 18th-century capital of Williamsburg restored and operated by The Colonial Williamsburg Foundation. The town includes more than 500 restored buildings, renowned historical museums, educational outreach programs for students and teachers, lodging, and culinary options from historic taverns to casual and elegant dining. Our adventure began with an afternoon at The Taste Studio of the Williamsburg Inn with a contemporary kitchen demonstration kitchen providing an intimate, fun setting to learn and share an unforgettable meal. The teaching and the menu can be customized to you and your guests needs. On this day, the festivities included chilled pear and peach bisque, seared salmon, topped off with a demonstration of crème brulee accompanied by whipped cream, chocolate sauce and a side of fresh berries. Heavenly. The Williamsburg Inn is Colonial Williamsburg’s landmark property, built by John D. Rockefeller Jr. and opened in 1937. Since then, the Inn has been host to royalty, heads of state and visitors from all over the world. Guest rooms are spectacularly appointed with a focus on providing the most luxurious guest experience possible. Inn guests have included Queen Elizabeth II and Prince Philip (in 1957 and 2007), former American Presidents, Emperor Hirohito of Japan, Salvador Dali, Robin Williams, Quincy Jones, Barbra Streisand, Betty White and Tom Hanks. They are waiting to add you and your guests to their VIP list! Incorporating period design elements from the Brighton Royal Pavilion, the Regency Room is the classic setting for dining and dancing and the perfect location for a formal reception. Windows on all four sides of the room provide garden views. Later that evening, we were welcomed by Thomas Jefferson himself (or perhaps a very good actor) with a Fife and Drum welcome reception in the East Lounge. Young musicians train for many years to hopefully land a spot in the Fife and Drums corps, and The Colonial Williamsburg Foundation is justifiably proud of each of these truly remarkable talents. Following the musical interlude was an hors d’oeuvres reception filled with a series of specialty savory pastry tarts: brandy mushroom, pea hummus, braised short rib, brie apricot, and warm crab salad. The treats were accompanied by a custom cocktail: bourbon and smoked apple sage jam, served in a copper mule. Dinner in Providence Hall proved another magical experience. The Hall was built around 1770 as the dwelling for a colonial mill near the Chickahominy River, and was restored and furnished by the Colonial Foundation. The Hall has hosted presidents, prime ministers, and other luminaries, such as Katharine Graham and Joan Rivers. Dinner started with an array of amuses: duck confit on sweet potato blini, and drunken cherries accompanied with rosé cava. The entrée course consisted of seared rockfish, roasted polenta, and beurre blanc, paired with Barboursville Reserve, Virginia chardonnay. Desert was a custom chocolate cake and macarons, topped off with a Cooper Vineyards Noche for sipping. Nightcaps of signature cocktails followed at the Wiliamsburg Lodge. Designed by Gilbert Stanley Underwood, an American architect who used natural surroundings and materials to design National Park hotels and Union Pacific railway stations, the Lodge blends the style of western lodges with classic Virginia architectural details. The next day began with a wedding showcase back at The Lodge, the perfect setting for large weddings. From glamping to southern farmhouse, each ballroom of the Lodge was on display with different sets to illustrate the Colony and Virginia Rooms versatility. We found horses and carriages at the ready to show us the town as it was meant to be seen in Colonial times. After a tour of the Governor’s palace, the garden maze and the ground, it was off to a Garden Lunch prepared byThe Williamsburg Lodge Culinary Team of Executive Chef Anthony Frank and Executive Sous Chef Justin Addison. The citrus poached shrimp salad, candied fennel, whipped goat cheesem and apple pepper relish showcased some of the regions best. The main course was pan roasted chicken breast accompanied by a stunning warm quinoa pilaf. 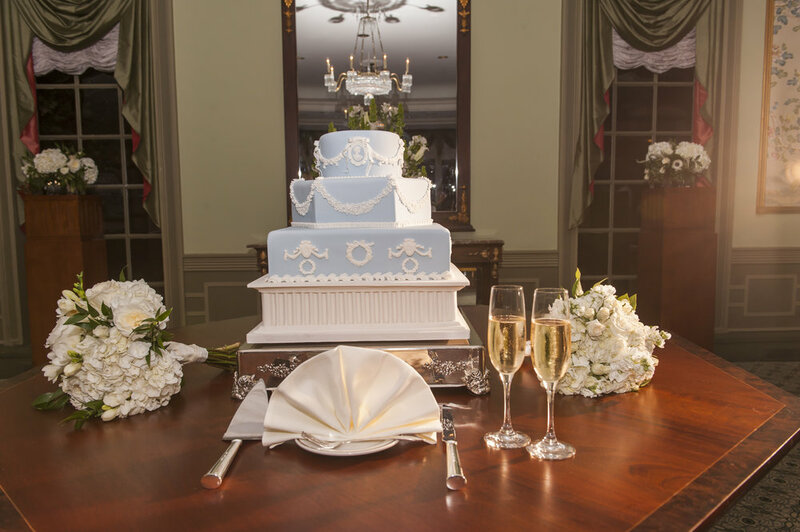 The dessert smorgasboard was set up in the Regency Room as a bridal celebration, just like your guests can experience. Delights such as an ice cream and sundae candy bar, mini shot glass desserts, and wedding cake tasting station were on display. Following an afternoon break, the evening commenced with a visit to the central shopping district, Merchants’ Square, recognized as one of the earliest, if not the first planned shopping districts in the United States. After some sightseeing, it was off to dinner. Noted as George Washington’s favorite for seafood, Christiana Campbell’s Tavern is a unique setting for the night before the big day. 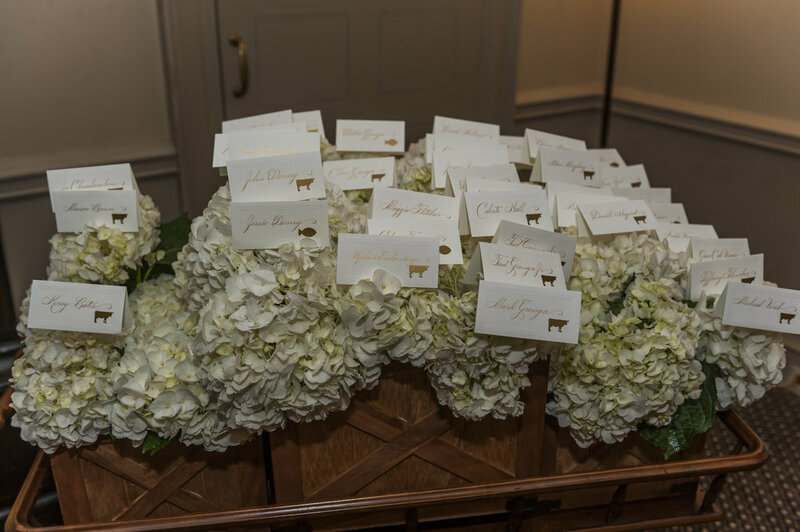 Festivities began with Mint Juleps on the patio, followed by Christiana's Favourite Salad, and Beef Tenderloin and Crab Cake was the entrée. It was accompanied by Mrs. Campbell’s Famous Cook's Vegetables and Sweet Potato hash. Dessert was Homestyle Ice Cream, which in this instance was yummy strawberry. Mrs. Campbell herself was on hand for the entire event along with balladeers playing sea shanties. We are excited for you to experience the history and the hospitality of Colonial Willamsburg and create your own historical traditions!